More than 140 UC Merced students walked the stage during Fall Commencement. 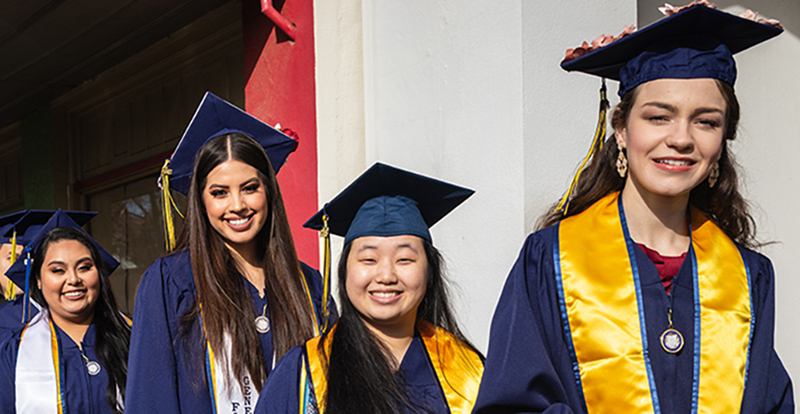 More than 140 students became proud UC Merced alumni Saturday, Dec. 15, at Fall Commencement at the Art Kamangar Center in the Merced Theatre. 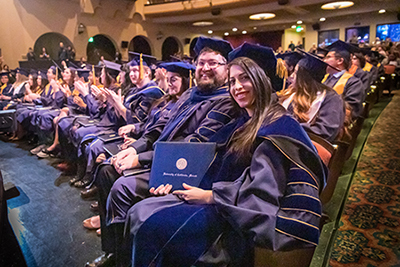 Students receiving their bachelor’s, master’s or doctoral degrees were honored in front of a theater full of friends and family. Chancellor Dorothy Leland congratulated the students on their achievements and their roles in helping guide the future at UC Merced. “You are all pioneers, helping us build a culture of inquiry, discovery and learning that will last for generations,” Leland said. “You have persevered through challenges and overcome obstacles, and here you are, more prepared than ever to succeed in whatever field you choose to enter. 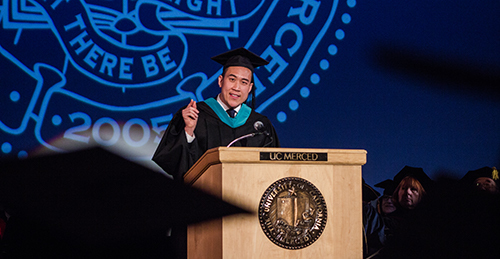 David Do ('09) encouraged students to be different during his commencement speech. Alum David Do (’09) delivered the commencement address. Do works in the Washington, D.C., Mayor’s Office as the interim director of the Department of For-Hire Vehicles. He was part of UC Merced’s first graduating class and helped spearhead the campaign to bring First Lady Michelle Obama to campus to deliver the commencement address in 2009. Do discussed his trials in becoming the first in his family to graduate college and what he has learned since his time on campus. “Learn to appreciate your differences because oftentimes those differences become the strengths and skills that will make you stand out to others,” Do said. “I encourage you to find your niche – an area that you’re passionate about and work extremely hard at it. The recent graduates join a Bobcat alumni family that has more than 9,000 members. Graduate students pose after receiving their diploma.